Commitment and Consistency has potential implications of use for both the attacker and victim in scenarios regarding Social Engineering. The Attacker or Investigator hoping to employ the Social Engineering technique of Commitment and Consistency usually tries to get the subject or victim to divulge a small piece of information towards the overall intended goal. By getting the subject to remain consistent with things they’ve already said, the attacker may get the subject to reveal even further information. On the other hand, the attacker must remain consistent with what they are asking. The attacker should start off small and escalate their information gathering. To use an unrealistic example, an attacker should never start off asking for the nuclear launch codes. This request will be denied, and the attacker will be left with asking where they are kept or who has access to the codes. They are going backwards in their requests and appear to be bargaining instead of remaining consistent to their original goal. However, if they start off small and move up with each new piece of gathered information, it will seem like a more natural progression and will not appear so obvious to the victim. Sometimes it can be quite hard to end up disagreeing with yourself. We all have, at one point or another muttered the phrase, “I’m sorry I changed my mind” at least once in our life. As a potential victim, people need to be aware of their gut instincts and realize that it is okay to change their minds. One answer does not mean a second one needs to follow. Also, be aware of what is being asked of you. Always think one step ahead about what can be done with the information or answers you give. Read over company policies, as many of them will have sections of what is and isn’t okay to tell people. Even small, seemingly insignificant commitments can lead to being exploited. For example, “Hello, how are you today?” You answer, “I am doing great….” now prepare for the exploit… “That is good to hear, because some people that are not doing so great can use your help.” You can’t go back on that now, you are still doing great and committed to it. Examples of the Commitment and Consistency principle can be seen in many marketing situations. Businesses will often compete against each other in an attempt to win market share. Money will be spent trying to “one-up” the competitor without any real return. Auctions sites are another example of where a person’s commitment and consistency will kick in. Certain people may increase their bids above a value they are comfortable with just to win the item and avoid their opponent from winning the auction. See the Dollar Auction Game: A Lesson In Conflict Escalation. Ryan Healy wrote a story on his blog about going to the circus. He spent $44 on tickets, $5 on parking, and drove 40 minutes just to get there. His daughter wanted cotton candy so he gave her a $5 bill expecting it to cost less than that. The vendor charged $12 for a bag of cotton candy. In normal circumstances, this would be a definite deal breaker, but Ryan had invested so much time and money already that he easily parted with the extra $7. To be successful in using the Commitment and Consistency principle, the attacker must get the victim to initially comply with a small request. If the victim is smart enough to never comply, the principle cannot be used. 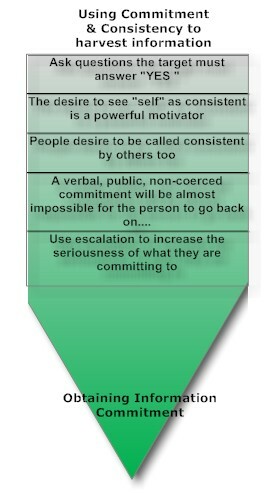 More information on Commitment and Consistency and Influence in general can be found in Robert Cialdini’s book, Influence: The Psychology of Persuasion.